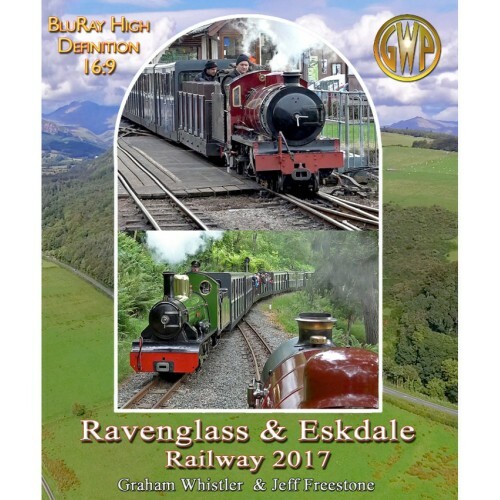 The 15 inch, 7 mile long Ravenglass & Eskdale Railway (also known affectionately as La'al Ratty) runs from the Cumbrian Coast through two of the most beautiful valleys in the Western Lake District. This all new film includes plenty of action from three of the railway's resident steam locos and diesel Douglas Ferreira. See the new "Spanish Loco" including footage from Spain, its arrival and restoration in Cumbria. Steam trials of the new loco on the railway in December 2016 are featured, as well as Santa Special Trains. The film will take you on the complete journey featuring River Mite with cab ride and dramatic trackside action. There are some amazing aerial drone footage of the railway, skillfully filmed for us by Chris Munn. Filmed and edited with 16:9 wide screen high definition Sony equipment by Graham Whistler and Jeff Freestone. R&ER driver Peter van Zeller gave help with the script and kindly filmed the new loco in Spain as well as the railway's track gang busy with winter repairs. Narrated by BBC's Nicholas Owen. Running time - approx 85 minutes. What a great film with many new camera angles and the drone footage is a wonderful enhancement. I have the previous version which is very good but this so much better. The editing is perfect along and along with Nicholas Owen's commentary it is an all round an excellent video. But do get the BleRay version the definition is amazing and well worth the little extra cost. Another superb offering from the Whistler stable. Fantastic photography further enhanced by some superb drone footage. Not only locomotives to view but also some of the work behind the scenes to keep the railway running smoothly. Even if you have the previous versions of Graham's Ratty videos/DVDs this latest one is well worth having - very easy watching. Graham Whistler we watch it together, fantastic! Great balance which will appeal to the Ratty loyal as well as being a great memento of someone's day out. Big grins all round when Nicholas Owen spoke about the 'Chris Munn's drone footage'. Thank you. Thanks also for the new R&ER film which arrived yesterday and which we have already enjoyed. As always a superb production with your great camera work and editing. Also some great colours and very atmospheric shots in the Santa Specials and the trial steaming of the "engine from Spain". The use of the drone and the aerial shots added a great new dimension and as always Nicholas Owen was superb on the commentary. Just one suggestion from someone who has never visited the Ratty and that is a map of the route would have been nice. Again sincere thanks for a superb hour and a half.